Online Support Awesome 24/7 Support. Thomas the Tank Engine My First Tri Scooters and Bikes, Sit and Ride-On. Fantastic range of Thomas & Friends My first outdoor range! Start training now with these first time Tri scooters & bikes, First Ride On, Train & Track Set... THOMAS MY FIRST TRI SCOOTER. 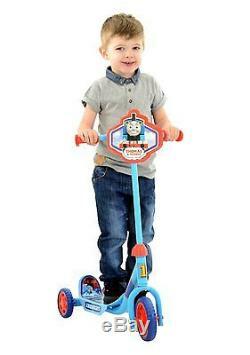 Enjoy hours of scooting fun Thomas & Friends Tri-Scooter, perfect for any Thomas fan! 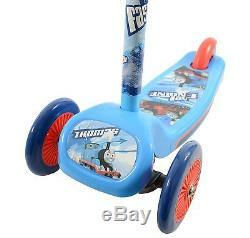 Product has three wheels for extra stability for little beginners. Features colour printed anti-slip footplate, 15cm (6") front wheel with puncture proof tyre, 10cm (4") rear wheels with puncture proof tyres, adjustable handlebar height, bright and colourful Thomas plaque and graphics. 15cm (6) front wheel with puncture proof tyre. 10cm (4) rear wheels with puncture proof tyres. Fun Thomas character plaque and graphics. 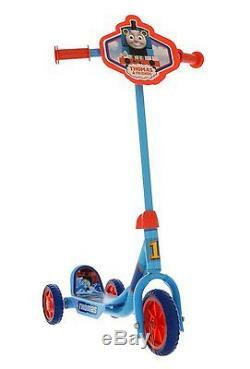 THOMAS TILT N TURN SCOOTER. 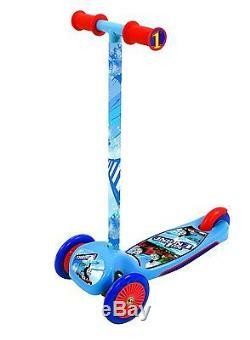 Cool scooter featuring Thomas character graphics comes with easy tilt "n" turn steering action, perfect for hours of outdoor scooting fun! Printed anti-slip footplate, rear footbrake, wide footplate for extra stability, removable handlebars for easy storage. Easy Tilt N Turn Steering action. Wide foot plate for extra stability. Removable handlebars for easy storage. 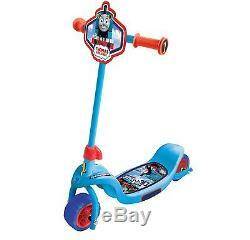 THOMAS MY FIRST INLINE SCOOTER. Sturdy first in-line scooter, with extra wide front and rear wheels - perfect first-time scooter for youngsters! Comes with colourful Thomas plaque and graphics. Features chunky puncture proof tyres to aid balance, wide colour printed footplate for extra stability, front mudguard, adjustable handlebar height. Chunky puncture proof tyres to aid balance. Wide colour printed footplate for extra stability. Bright and colourful Thomas graphics. THOMAS MY FIRST SIT AND RIDE. Exciting Thomas first ride-on, perfect for the little one's first adventure! This sturdy ride-on with a rear backrest for support comes with bright and colourful Thomas graphics, and is the perfect ride-on for any Thomas fan! Front and rear anti-tip feature. Fun and colourful character graphics. THOMAS RIDE ON TRAIN & TRACK SET. All aboard this authentic powered Thomas ride-on comes complete with 22 pieces of track. Ride around for hours of fun! Features authentic Thomas theme tune and sounds. Forward and reverse speed and hand lever control. Comes complete with 6V rechargeable battery and charger. Comes with a detachable carriage, perfect for extra storage! The train moves on the track only and the maximum weight allowance is 20Kg. 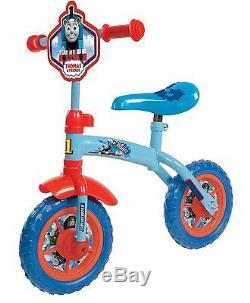 THOMAS 2 IN 1 10 TRAINING BIKE. A cool convertible bike that transforms from a pedal bike to a balance bike as the child improves stability and gains confidence perfect for little ones learning how to ride a bike. Comes with 25cm (10) lightweight wheels with puncture proof tyres, front mudguard, removable pedal and stabilisers, adjustable handlebar height, adjustable seat height, colourful character plaque. 25cm (10) lightweight wheels with puncture proof tyres. Adjustable handlebar height and seat height. 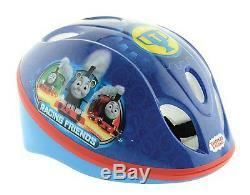 THOMAS & FRIENDS SAFETY HELMET. Thomas safety helmet, ideal for biking, skating and scootering. Protect your little ones with this Thomas safety helmet perfect for any Thomas fan! Foam padding for extra comfort and fit, quick release buckle, adjustable head straps, lightweight EPS inner, ventilated shell. To fit head size 48cm - 52cm. Foam padding for extra comfort and fit. 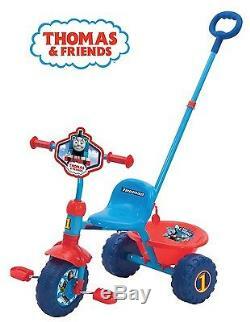 Thomas And Friends My First Trike. 1 x My First Trike. 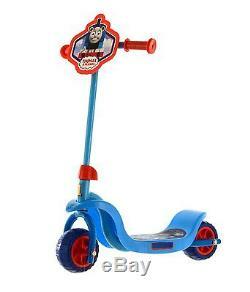 This fun and sturdy eye-catching trike will give your little one endless hours of enjoyment. 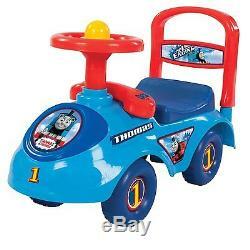 Ideal first trike with colourful Thomas graphics - perfect for any Thomas fan! Has robust tubular steel frame for extra stability, removable parent handle, adjustable handlebar height, seat height is 30cm. Also comes with a rear bucket for storage, front wheel clutch for free-wheeling. Robust tubular steel frame for extra stability. Chunky wheels for extra stability. Pedal Lock for pushing along mode. Adjustable handlebar height and seat height 30cm. Front wheel clutch for free wheeling. We are very professional and make the whole process a seamless one, so if you are looking for gifts, toys or essentials for your little one, you are in the right place. Our team are experts in this industry and we always put our customers first. Our fast-growing company is a result of hard work, great value and the highest quality products available. We are specialists in kids toys and childrens clothing. Our team are experts in the childrens toy industry and this means that we test for the safety, durability and quality. We only provide toys and gadgets that we believe in, even offering brands such as Crayola, Peppa Pig, Tomy, MVSports, Winning Moves, Jumbo Games, John Adams, Great Gizmos, Ravensburger and etc.. Online Toys The new era is about gaining exactly what you need without hassle but you need a reliable source for this. We have more than just fun and exciting products, we have a variety that can help your little one interact, learn and build. Find the best learning toys and other products sure to keep your child developing. Our range caters for children of all ages from just months old to teenagers. Childrens Toys for Christmas It goes without saying, many of us will be looking for toys during the Christmas period and luckily for you, we have them in abundance. We have Christmas themed toys and also kids toys for all occasions including birthdays, one-off treats, and christenings and of course- Christmas! This means that we partner with award-winning couriers to be able to dispatch our catalogue of goodies to customers throughout the country. We will be able to provide you with a tracking code so that you may follow your order online from the moment you complete checkout. We currently operate with many different couriers for this service. This option is the best avenue to take if you need an item for a short-notice gift, for example. We aim to ensure that all our items arrive with you in the condition you expect and within the timescales you pay for. However, there may be circumstances, rarely, whereby you do not receive such items as you may have reasonably expected. We will liaise with you and our couriers as far as we possibly can. It is in original undamaged packaging with all tags intact, the product is in the same condition as how you received it. You have a statutory duty to take reasonable care of our goods whilst they are in your possession and during transit. In the unlikely event of an item being received damaged or faulty, you have 30 days from the date of despatch to report this to us for Return. How do I return an item? We want to ensure you are totally satisfied when shopping with us so, if you change your mind for any reason, you are able to report an unopened item to us for Return within 30 days of it being despatched to you. All you need to tell us is which item you wish to return and the reason why. Sign up today for our official newsletter & get up to date with our new arrivals and also get our sneak peaks, tips and exclusive offers. 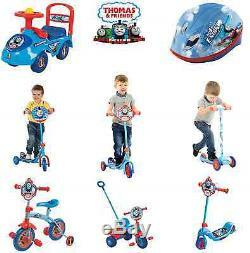 The item "Thomas the Tank Engine My First Tri Scooters and Bikes, Sit and Ride-On" is in sale since Saturday, April 9, 2016. This item is in the category "Toys & Games\TV & Movie Character Toys". The seller is "excel_shopper" and is located in BIRMINGHAM. This item can be shipped to United Kingdom, Ireland, Germany, France, Italy, Spain, Antigua and barbuda, Bulgaria, Croatia, Cyprus, Czech republic, Estonia, Finland, Greece, Hungary, Latvia, Lithuania, Malta, Poland, Romania, Slovakia, Slovenia, Sweden, Australia, Canada, Brazil, Japan, New Zealand, China, Israel, Hong Kong, Norway, Indonesia, Malaysia, Mexico, Singapore, South Korea, Switzerland, Taiwan, Thailand, Bangladesh, Belize, Bermuda, Bolivia, Barbados, Brunei darussalam, Cayman islands, Dominica, Ecuador, Egypt, Guernsey, Gibraltar, Guadeloupe, Grenada, French guiana, Iceland, Jersey, Jordan, Cambodia, Saint kitts and nevis, Saint lucia, Liechtenstein, Sri lanka, Macao, Maldives, Montserrat, Martinique, Nicaragua, Oman, Pakistan, Peru, Paraguay, Reunion, Turks and caicos islands, Aruba, Saudi arabia, South africa, United arab emirates, Ukraine, Chile.